2011 will be known as the year DC whipped the tablecloth out from underneath fans', replacing it's existing spread of a universe with a more streamlined continuity selection. While the 52 menu options are still tracking record numbers, a few issues in, I'm using those books as a basis to decide what stays on the old pull-list and what goes. Ol' Frank is a disjointed man and that's exactly what I initially thought of Alberto Ponticelli's interior art. 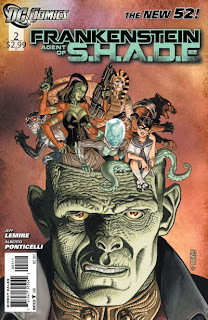 Now, with more of a handle on S.H.A.D.E's Creature Commandoes and writer Jeff Lemire's humour helping to balance out his dark arts, I find Ponticelli's style like that of a slightly looser, yet just as atmospheric, John Paul Leon. 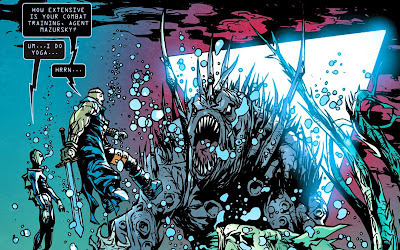 As Frank leads his classic-monster filled team from a small town that willingly feeds aliens its young, to a planet where his four-armed wife is fighting its entire population, I find what seperates this book from the rest of the DC 52 (and Hellboy if you want to go there), is the creativity and dialouge of Lemire himself. 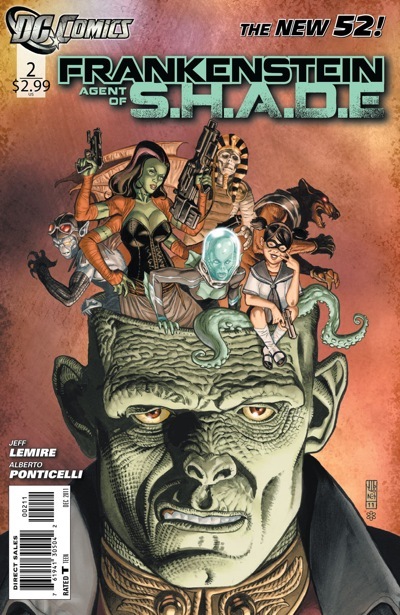 Jeff takes the quirkiness of Grant Morrison's Doom Patrol, adds his own offbeat concepts and penchant for personality, and creates a 'Frankenstein' of his own. A title/mad stroke of genius, brought to life by simply getting on with telling great fun stories. Like the straight-laced logo on a edgy 'youth' title suggests, the contradictions inside this book are enough to give anyone teenage angst. The only way the logo could've summed the book up better, is if it read; Ways To Tick You Off Digest. 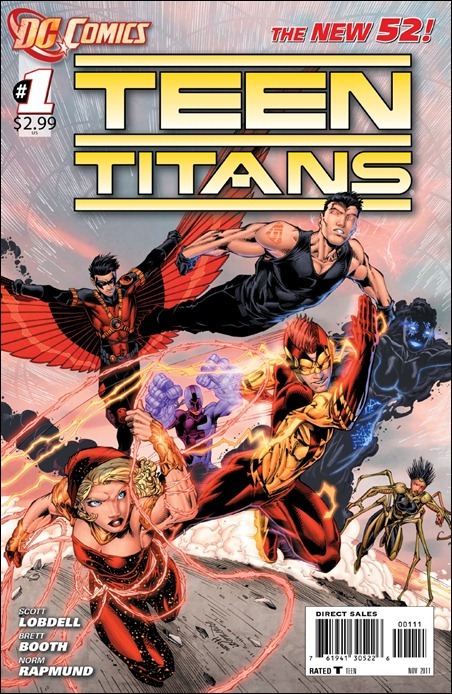 I tried to view this particular 'new reader grab' as a chance to be in on a New Teen Titans type revamp and watch history repeat itself. The glass didn't stay half-fill for long. Interviews vary, Justice League #1 suggests a history, Teen Titans #1 none at all, and the work of the creative team seems hand-stitched to dance around both. After months of touted backstage planning, it's just not good enough. This book should be launched by someone saying 'God bless Geoff Johns and all the characters put under his pen', then a bottle of decent plonk being broken across it's bow (or comic book equivalent). The ongoing titles baring his name always land on par with the characters involved and make new fans feel as welcome as us lifers and established lifers re-experience the thrill of being a new fan. Aquaman is no exception. Sparing much of the first issue to deal with real world thoughts of the character in continuity may have slowed the pace a bit, but when it's backed by an under current of plot that clearly illustrates Johns is headed somewhere, it all works together nicely. 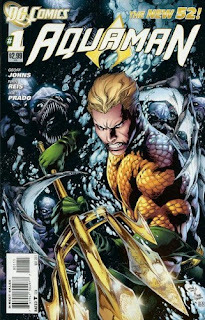 Plus it's just awesome having an Aquaman who can be stern and still a bright, positive hero back in print. We need more of those. As for the race of sea creatures dubbed The Trench, they easily take the award for best villainous contribution to date - especially illustrated by the master in the making, Ivan Reis. While they ensure I won't be swimming in the ocean this summer, with books like this around, there'll be plenty of reason to stay onshore. With the creators having survived the firing squad for Amanda Waller turned 'Angela-Bassettisized', and Harley Quinn going from cartoon crazy to video-game hoochie, Suicide Squad is finally on the shelves. The Vin Diesel action book of the DCU 52 - it won't win an Oscar, but it's 'shove a handful of bad guys in a room and give 'em a gun' type of action definitely gives you 'bang' for your buck. While an all-star line-up would've been nice, the shuffle brings a few gallons of new blood to the table, including the first few criminals to fall trying to win their freedom. Deadshot is still Deadshot. The Wall's 'tude is still just that (she even tortures her own team!) and El Diablo with his Spanish speaking, fire-starting ways, has already become my favourite Suicider yet (down from Bronze Tiger that is)! While it seems this is a complete restart, there's no endless chatter, just straight into a test of loyalty and sent to kill 80,000. Vin Diesel would be proud. 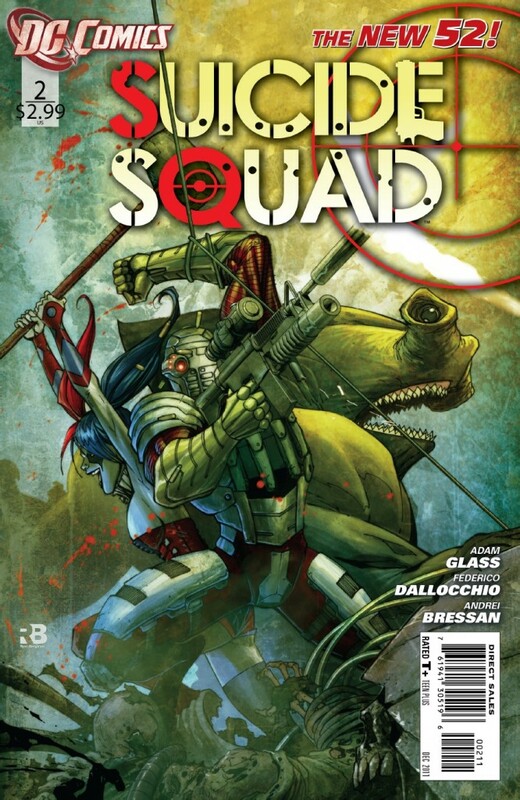 Now if only DC could get control of the number of artists the book needs so the pages didn't jar, this Squad would have a decent shot at going more then a couple of rounds. Verdict: ***** Dropped - Trimming the pull list down to just 14 (across all companies) requires some hard calls. This is one of them. 14?! Ouch. I don't think I could do that. Of course, I'm not really sure if I'm reading books to read the books or to do reviews any more. . .
Yeah Doug - it definitely isn't an easy decision, but comics to me are $7.50 each (with customer discount). Yip that ouch you just thought is what I thought too. Luckilly I also had a 'Why am I following this title' hard look at everything and that helped. God knows what I'll do if Captain Marvel, Gambit, The JSA, Darkhawk, and The New Warriors relaunch though! I've had to make some pretty big calls subscription wise, as you'll see I didn't even pick up one Bat or GL title as to get the best bang for my buck, I couldn't dedicate half the line to one character. Capullo's Batman and Tomasi's GLC will just have to be read in trades.